Claire "Down in Antarctica" sent me this photo, and I had to share it because it's so cool. That's the South Pole (the South Pole!) and that's a sign for me (for me!) right next to it. So cool. What a great Christmas present. Thanks, Claire. 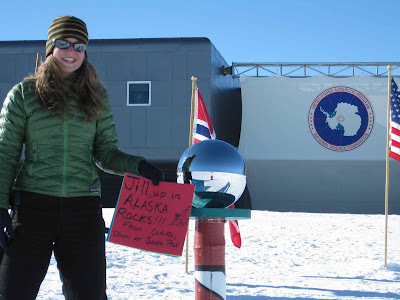 Claire told me they are currently enjoying balmy (read: Frigid) summer weather on the South Pole, where she works for a physics project called "Icecube." She offered to traverse the continent on a bicycle with me if I ever decide to do so. Careful, Claire, I might just take you up on that offer. Looks like a heat wave down in South Pole. Did she specify which continent? It's probably close to impossible to work out the logistics and actually accomplish such a traverse on a bicycle. I'm not sure anyone has ever done it before, although I could be wrong about that. U Rock Da House Jill! Jill- Sorry. I rode across Antarctica in '96. on a side note, look at the full size image and check out the reflection of the person taking the picture. I'm guessing because of the curved reflective ball on the pole the person looks like a fire hydrant, with a red suite and green hat. funny. Yep. The pic was taken by my buddy, Karthik. We wintered at South Pole in 2007. We just had a skier tourist come in from Patriot Hills at 80 South. We could totally bike in from there! Only 600 miles and it is a dry cold down here, so it doesn't feel so bad! Here's an article, with photos, about someone who made the attempt in 2003, on a specially built "ice bike." That is a cool pic. You've got quite a reach. That is one cool pic. Lucky you, Claire! Any kind of ground traffic along that route? (From Patriot Hills to the South Pole?) Is there a "trail" of sorts, or did the ski tourist just use maps and blaze his own path? You've got me really curious now. I'd never given Antarctica serious thought before, but it seems possible and even probable that people could ride bicycles there. 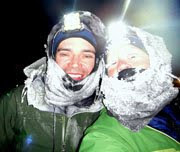 Mike Curiak has already done a lot of pioneering of self-supported distance touring in extreme winter condtions. None of it looks easy or cheap, but, amazing nonetheless. Wheels are turning. Thanks again for the great photo. Yep. The wheels in my head are turning now too. I think the cost logistically would be around 45,000USD. Ouch, BUT if we can convince some sponsors and possibly use the fact that 2007 - 2009 is IPY (International Polar Year... I know, it is 2 years). We may be able to pull it off. I am going to start emailing some of my Antarctic and NSF contacts and see what is possible. In the meantime, you, my talented friend, should apply to the Antarctic Artists and Writers Grant through NSF. I am not sure how flexible they are, but I will get you the information. Lots of folks do Patriot to Pole. It is well enough established that there is a nice route. No one has ever biked. We could drag banana sleds behind the bikes with extra fuel, gear, GPS, etc. I will email you more! And yes. Did see -100F. We have the "300 Club" at pole. We crank the sauna up to 200F, sit in there as long as possible. Run out to the Pole naked and run back in. You burn your lungs, but it is great fun. Coldest wind chill I felt was -153F. We were outside everyday. Not that this in any way negates how much this photo rocks, but I notice clair is holding atleast 3 sheets of paper, possibly many more. You can even see a message on the back of one. I just picture her going out with her friend (the photographer) and doing a series of these shots one right after the other with all different manner of messages to all different people from all over the world. I'm just imagining who they are and what the messages say. One thing is pretty clear, she's rocking all of their worlds. Mantle photos everyone. (or blog photos everyone).